This is the best car for you if you want to drive a (relatively) affordable performance car that is still at the top of its game after more than four decades on the road. 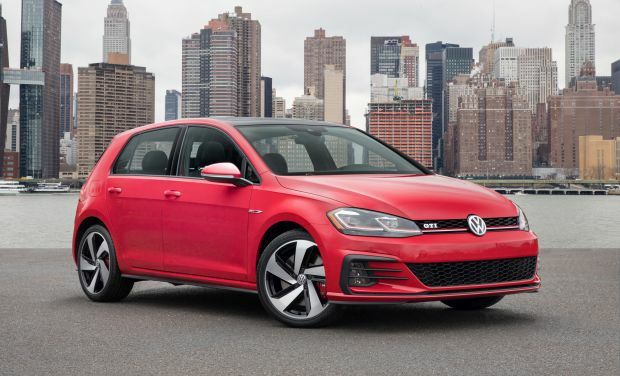 This report focuses on the Volkswagen Golf GTI, which is one of the sporty variants of the German automaker’s family of compact two- and four-door hatchbacks. The Golf GTI (GTI henceforth) burst onto the automotive scene in 1976. It was a small two-door hatchback powered by a sprightly four-cylinder engine that allowed the car to reach a harrowing-for-its-size 110 mph. With precise steering and sporty suspension tuning, the GTI punched well above its weight and price class in terms of handling. 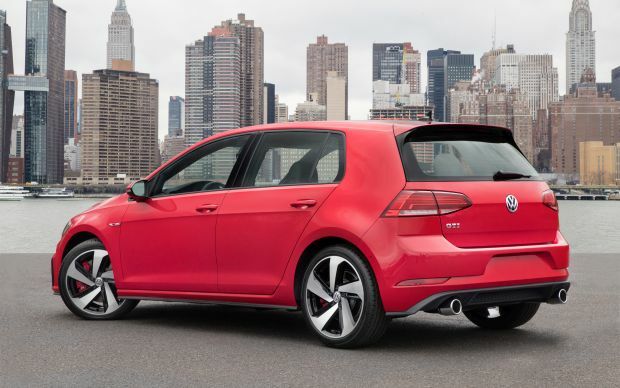 These characteristics have been GTI hallmarks over the course of 42 years and seven design generations. Despite Volkswagen’s recent troubles in the wake of its diesel engine emissions cheating scandal, the GTI remains a steady seller. Among its direct competitors are the Ford Focus ST, Honda Civic Si, and Mini Cooper, all of which are front-wheel drive like the GTI. There’s the rear-wheel drive Subaru BRZ and similar Toyota 86, as well as the Nissan 370Z. We’ll also include the all-wheel drive (AWD) Subaru WRX. Note that Volkswagen does produce an AWD Golf, called the R, but it’s far more powerful and expensive, serving as a rival to the similar purpose Ford Focus RS and Subaru WRX STi. Buy the ’18. Volkswagen has made some meaningful changes to the GTI, improving its looks, power, handling, safety, and customer confidence. With the brand still reeling from the emissions scandal that has cost billions of dollars in fines and compensation, VW remains somewhat desperate to attract buyers to its showrooms. While certain versions of the GTI can get pricey, expect dealers to offer enticing incentives in order to get you behind the wheel. Further, every new 2018 Volkswagen comes standard with a six-year/72,000-mile bumper-to-bumper factory warranty that’s transferrable to a second owner if you sell your vehicle before it expires. That’s double what you’d get from the likes of Ford, Honda, Nissan, or Toyota, and it’s even better than the 5-year/60,000-mile coverage you’d receive from Hyundai or Kia. VW doesn’t have the best reputation for reliability, a condition compounded by the fact that out-of-warranty repair costs track higher than the industry average. As such, we applaud the company for going an extra mile (or 12,000) to help alleviate this concern. The 2018 GTI lineup consists of the base S, mid-level SE, and flagship Autobahn. All have four doors, as the 2-door version was dropped for model-year 2017. The Sport grade has been discontinued for ’18 as well. Styling: The GTI is a timeless design that will still look good in another 42 years. 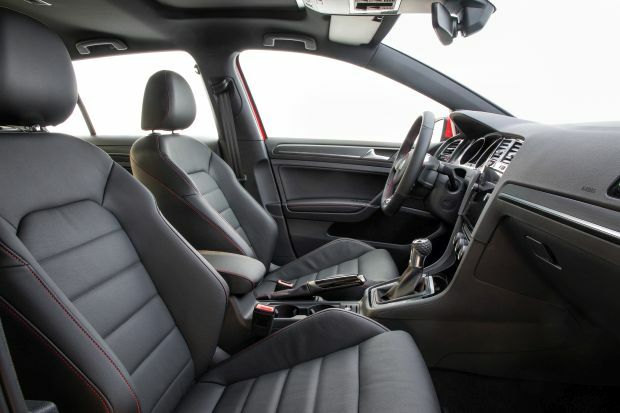 Its wedge shape, red stripe across the grille, golf ball shift lever on models equipped with the standard manual transmission, and tartan cloth upholstery on the S and SE grades are nods to the car’s past. Standard LED daytime running lights (full LED headlights are on SE and Autobahn), LED taillights, a flat-bottom steering wheel, available leather upholstery, and a touchscreen infotainment system with support for Apple CarPlay and Google Android Auto are just a few of the reminders that you’re driving a vehicle fit for the 21st Century. GTI’s sport bucket front seats have prominent side bolsters that are designed to keep you from sliding around during enthusiastic driving. Larger occupants may find them a bit too narrow, however. Headroom is generous all around, even under the housing of the standard power sunroof on SE and Autobahn models. The front seats have long fore and aft travel, allowing for outstanding legroom. The back seat is supportive, but legroom isn’t much better than in a typical compact car. With 17.4 cubic feet of cargo space with the rear seatbacks raised and 53.7 with them folded, the GTI’s practicality is virtually unmatched among sporty cars. Examples we’ve evaluated have shown generally excellent build quality, with nicely textured plastics and plenty of soft-touch surfaces. All controls are arrayed logically and move with Germanic precision. In-vehicle connectivity is where Volkswagen has really stepped up its game in recent years. The 8-inch touchscreen display on SE and Autobahn models integrates seamlessly into the dashboard, and you’ll be delighted with its intuitive interface and responsive operation. Mechanical: This is where the GTI truly shines. All models are powered by a variant of Volkswagen’s corporate 2.0-liter turbocharged four-cylinder engine. For 2018, it produces 220 horsepower and 258 pound-feet of torque, increases of 10 and 28, respectively, versus the 2017 iteration. The extra torque is most noticeable in off-the-line acceleration. There’s some turbo lag, but it’s not nearly as egregious as it was in GTI models equipped with older versions of the 2.0-liter motor. Torque steer, the tendency for a front-wheel-drive car to pull to the side in full-throttle acceleration, is well-controlled. The standard transmission is a 6-speed manual that has slightly notchy shift action, but a very smooth clutch, making models so equipped reasonably easy to drive, even in heavy traffic. A 6-speed dual-clutch automatic transmission is a $1,100 option across the board. The automatic is fine if you can’t be bothered to change gears yourself, but the manual is where it’s at for maximum driving pleasure. The GTI sticks to the road like glue, thanks to grippy tires and smart suspension tuning that allows for little body lean in fast turns while maintaining a surprisingly compliant ride. Note that the tires are rated for summer weather, so if you live where it snows, you will want to invest in an appropriate set of treads for the winter. Steering feel is tight and precise, maybe a bit too much so, as dips in the pavement can trigger a sudden tug on the wheel that can be disconcerting if your mind happens to wander for a moment. SE and Autobahn models have a new “VAQ” electronic front differential that can apportion torque between the front wheels as the computer deems necessary. These grades also get uprated brakes from the Golf R as standard equipment for 2018, and they help the GTI stop on its nose. Drivers can adjust some throttle, suspension, and exhaust settings via a button on the center console that cycles through Eco, Normal, Sport, and Custom settings. The latter offers more precise control over some functions via the infotainment system, such as enabling a secondary exhaust mode that sounds louder (though not annoyingly so) than standard. At cruising speeds, the GTI exhibits some tire noise, but surprisingly little wind rush. Features: The GTI S comes standard with LED daytime running lights, fog lights, and taillights, heated exterior mirrors, and front seats, rain-sensing windshield wipers with heated washer nozzles, 8-speaker audio system with 6.5-inch touchscreen infotainment, and a rearview camera cleverly hidden behind the VW badge on the tailgate that automatically deploys when the vehicle is put in reverse. SE versions add a power sunroof, full LED headlights, keyless access with pushbutton engine start, 8-inch touchscreen infotainment, satellite radio, VW’s Car-Net Security & Service telematics, blind-spot alert with rear cross-traffic detection, autonomous emergency braking with pedestrian detection, and forward-collision warning. At the top of the range, the Autobahn gets a 12-way power driver seat, leather upholstery, dual-zone automatic climate control, VW’s Fender-brand audio system, imbedded GPS navigation, upgraded telematics, front- and rear-obstacle detection, and radar-based adaptive cruise control. We wish the full range of driver-assistance features was standard on all models, as only the Autobahn grade is eligible for Top Safety Pick status from the Insurance Institute for Highway Safety. Starting prices are higher on the 2018 GTI S by $820 and on the Autobahn by $975, while the SE actually costs $420 less than it did for 2017. Note that all prices listed here include an $850 destination fee. With manual transmission, the 2018 GTI S lists for $27,265, the SE for $31,320, and the Autobahn for $35,920. Add $1,100 to each model for the automatic. The only factory option is leather upholstery for the SE grade, which is a very reasonable $695. Despite its lack of advanced driver-assistance features, our pick of this lineup is the base S with manual transmission. There aren’t many cars that are this fun and practical that come with a sticker price of less than $27,500. EPA-estimated fuel-economy ratings for the 2018 GTI are decent at 25/33/28 mpg city/highway/combined with manual transmission and 24/32/27 with the automatic. Volkswagen recommends premium-grade 91-octane fuel, but the GTI can run on 87-octane regular with a slight reduction in horsepower and torque. After a steady stream of updates over the last couple years, 2019 will probably be a quiet one for the GTI, as Volkswagen is reportedly cooking up the next, and 8th generation, of this sporty hatchback for a model-year 2020 debut. Expect it to retain turbocharged four-cylinder power, but thanks to the addition of a battery-powered electric motor, output could increase to 250 horsepower while fuel economy could also see a corresponding boost. The new GTI will likely still use the “MQB” platform that underpins the current model, but with tweaks to help reduce curb weight by potentially up to 150 pounds. Ford Focus ST, which doesn’t ride or handle, nor is it as refined as the GTI. Mini Cooper, which is a bit smaller than the GTI, can be even more expensive, and has a worse reputation for unreliability. Subaru BRZ/Toyota 86, these twins are arguably as much fun to drive as the GTI but are nowhere near as practical. Honda Civic Si, though not available as a hatchback (the costlier but more powerful Civic Type R is), this sporty car is as much fun as the GTI while generally being less expensive to boot. Subaru WRX, which doesn’t have the GTI’s hatchback practicality, but it comes with the all-weather security of all-wheel drive and can cost the same or less as the GTI Autobahn.